another club member. 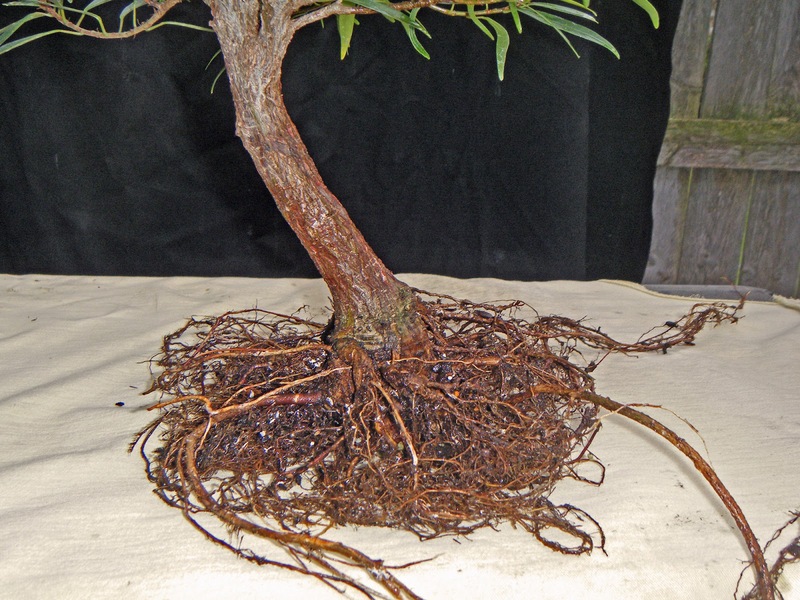 The tree was healthy and the species is one of my favorites; but the nebari consisted of one large side root that coiled around the pot several times, and not much else! So, in late autumn of 2010, I applied this flat-cut technique to my new fig. 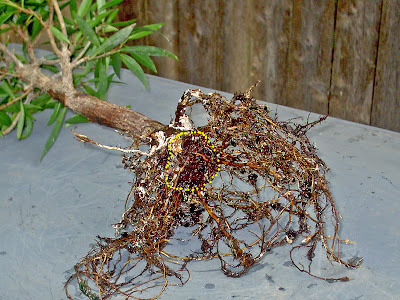 I left a few small roots just above the cut; the big coiling root was removed. (I'm sorry to say I didn't get any pictures at the time. I'm the kind that must sometimes remind myself to take pictures.) 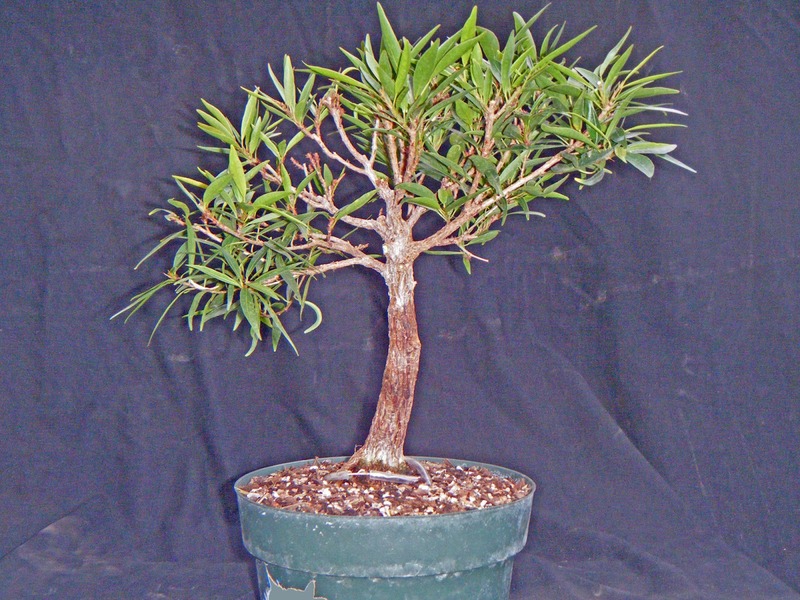 The tree, potted in a coarse mix, went into the Bonsai Crate for the winter, where I could baby it. By mid-May of 2011 the tree was thriving, and I was curious to see how well the flat-cut technique was working. I proceeded to repot. 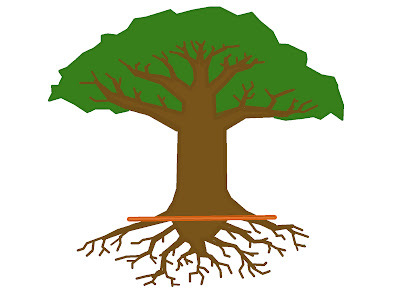 While I didn't find quite as many new roots as I'd hoped for, the ones that were there were well-distributed, and almost all were growing from the perimeter of the cut. Only one or two were growing from the cut's face. The trunk was about as thick as my forefinger. This picture isn't as clear as I would like -- I was using a different camera then, of lesser quality. 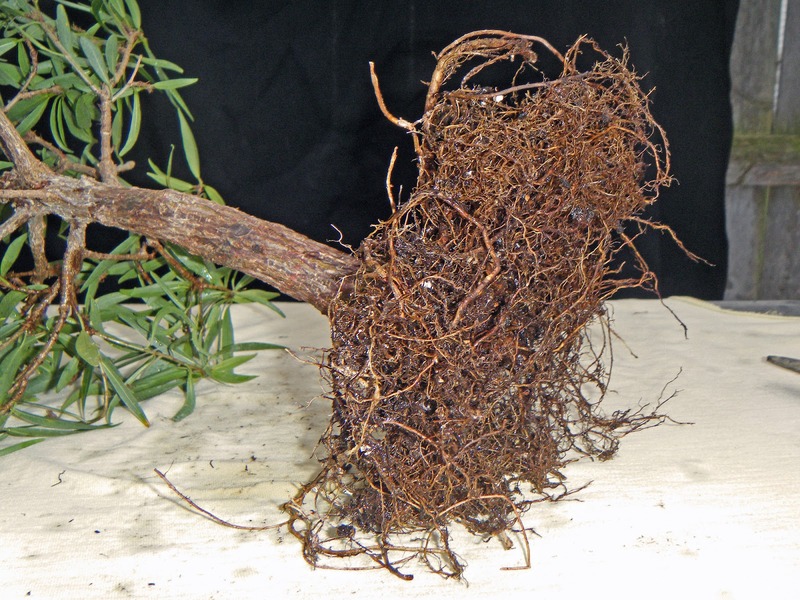 But you can get an idea of what the root system looked like after just five months. The rough circle of yellow dots shows the approximate perimeter of the saw cut. A few days ago I noticed that this fig's roots were starting to chase themselves around the inside of the pot. So on Thursday I took advantage of a mild day to repot again. I'll let the pictures tell the tale of what I found. After the roots were combed out. Only one downward-growing root was removed before this picture was taken. 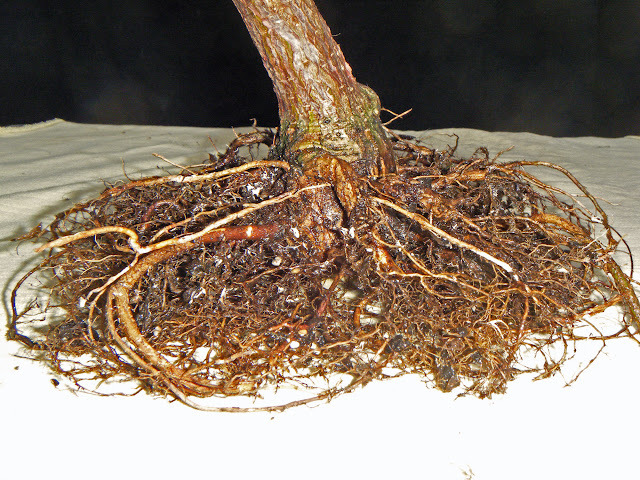 Closeup of the roots after light trimming. 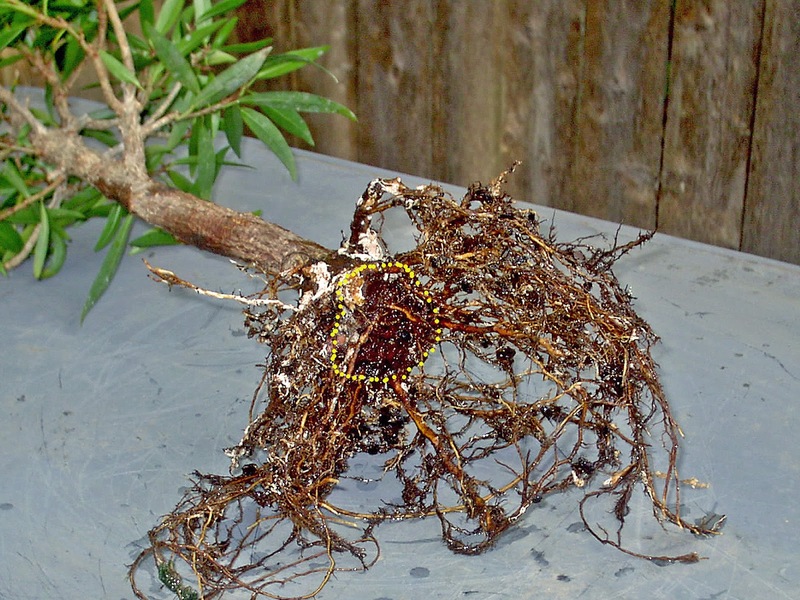 Less than 20% of the total root mass was removed. A nicely shallow, compact root system! And the nebari will look good, I think. April 12, 2012. The trunk girth has roughly doubled in 11 months. Provisional front. Clearly, this procedure works just fine on Ficus salicaria. 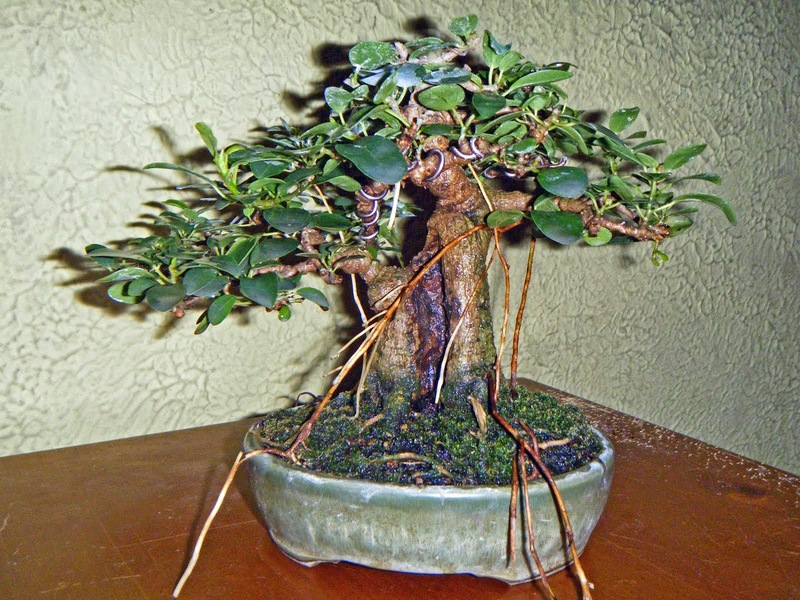 I've seen pictures of successes with Ficus microcarpa, as well. I think it would probably work with other vigorous Ficus species, and possibly also with other tropical species like Schefflera. However, I haven't yet tried it myself on anything else. NOTE: On July 1, 2012, I had occasion to use this technique again. But this time I remembered to get "before" pictures. To jump directly to that post, click here. Steve - just received this, thought you may be interested. It's an old technique, but it sure works!